The Father - The Creator of the world and the first person of the Trinity. Jesus - The Son of God and our Friend. 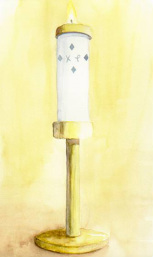 The second person of the Trinity. The Trinity The bond of love among the Father, Jesus, and the Holy Spirit - a community of Divine Love. Three in One. Mary - The Mother of Jesus, Mary is someone who helps us be closer to God. Priest - He is the one who represents Christ for us in the Church. He leads at Mass and hears our Confession. When he speaks the words of Absolution, he speaks for Christ to us. Deacon - Deacons serve the parish by giving their time and by helping with parish work. Christians - Everyone who is baptized is a Christian, even if they are not all Catholics. 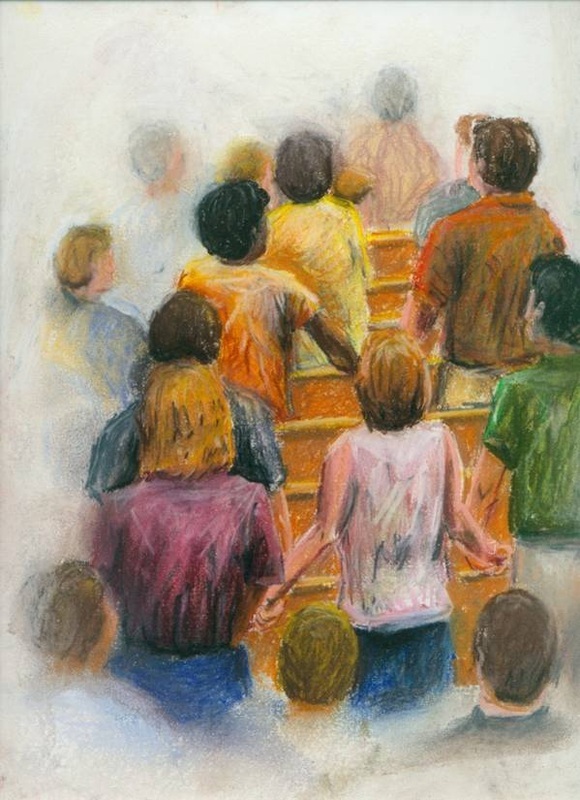 Many Catholics in the parish work to help us learn, grow, and pray. Sisters & Brothers - These are special people who have committed their whole lives to the church and who help us. Sacrament - A sign of God's love. 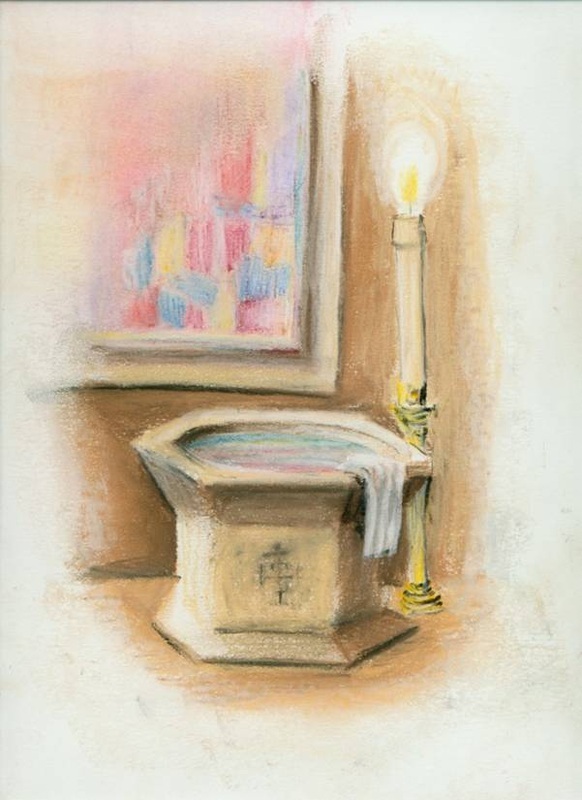 We can't see God, but in every Sacrament there are actions, words, or things that we can see, which help us be closer to God. Altar - The special table in church where we use at Mass. Consecration - The very center of the Eucharistic Prayer, when the Priest repeats the words from the Last Supper and the Bread and Wine are changed into the Body and Blood of Christ. Eucharistic Prayer - A special prayer used only at Mass to consecrate the bread and wine. Gospel reading - When we read from the stories about Jesus found in the Bible. Homily - When the priest explains the readings to us. Host - A special wafer of bread used at Mass. Last Supper - The last meal Jesus had with his friends, just before he sacrificed himself for us on the Cross. Offertory - When we offer the bread and wine, money, and ourselves to God during Mass. Penitential Rite - In the first part of Mass, when we say we are sorry for our sins. Sign of Peace When we shake hands or hug each other at Mass to say we are at peace before receiving Holy Communion. Blessing - What the Priest gives us just as Mass is ending, to help us be strong for the week ahead. 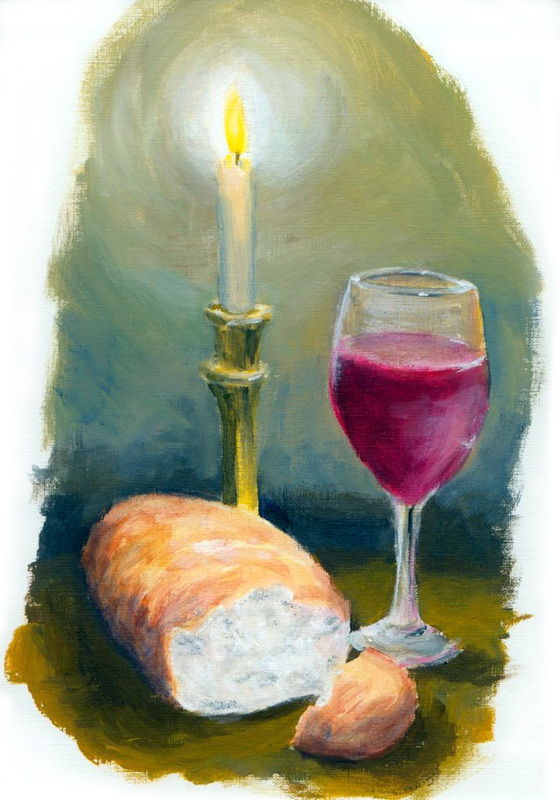 Celebration - We are happy that our sins are forgiven by God, so we think about this Sacrament as a little party with each other and God - a celebration! Reconciliation - This is a Sacrament. In it we turn away from sin and become better at loving God and each other. Conscience - When you know inside that something is right or wrong. Mortal sin - Choosing to do things which are terribly wrong - things that cut us off from being loving and makes us selfish. Sometimes it's a mortal sin when we fail to perform an act of love we had a chance to. Venial sin - Choosing to do wrong things or to fail to do right things. Ten Commandments - God's rules of love. They are made more clear by Jesus in his teachings. The Beatitudes - This is where Jesus explains the Ten Commandments and helps us see what he wants us to do and how he wants us to live. Examination of conscience When we pause and think over what we have done in our lives to see how we have sinned and how we have loved. There is a sample of one if you click here. 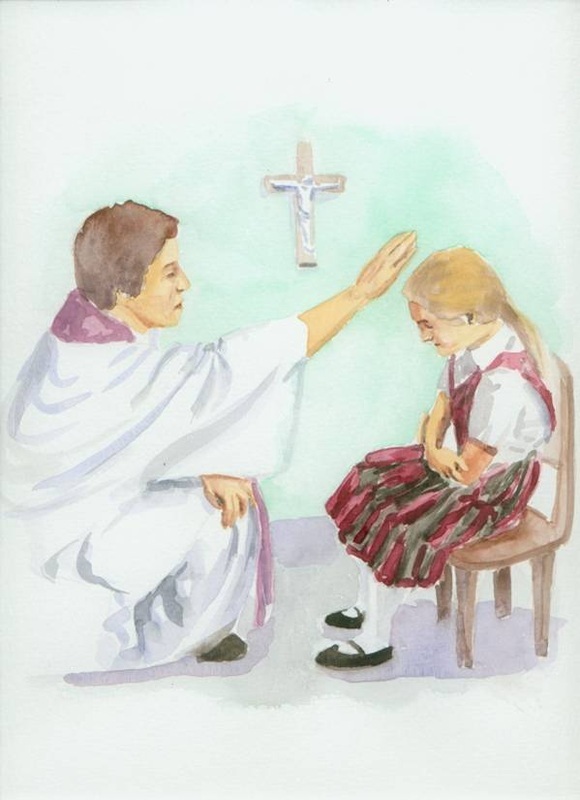 Confess - In this Sacrament, it's when we say our sins aloud to the Priest. He promises never to repeat or even remember our sins. Penance - After we confess our sins, the Priest asks us to do something to prove we are willing to change our lives and try not to sin again. Act of Contrition - A prayer that show we are really, truly sorry for our sins. There is a sample of one if you click here. Sorrow for sin - When we realize we did something wrong and feel in our hearts that we hurt God, ourselves,and others - and also decide we no longer want to do that. Laying on of hands - In this Sacrament, the Priest touches our forehead when he prays the Absolution. This is a sign that we are receiving God's power to not sin again. Absolution - In this Sacrament, this is when the Priest prays for us and God heals our hearts from sin. It is a very important part of the Sacrament. Holy Water - Blessed water. When we use it we remember that we are baptized. Candles - We light candles at church when we celebrate together as a reminder that Jesus is the Light of the World. 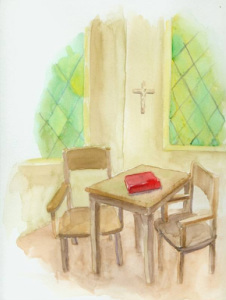 Reconciliation room - This is a small room within the church where we go to celebrate the Sacrament of Reconciliation. Stole - The priest wears this as a reminder that he is the one person in our parish who represents Jesus. Baptism - In this Sacrament, we enter the Church as young members and it is the chief Sacrament in which our sins are forgiven. 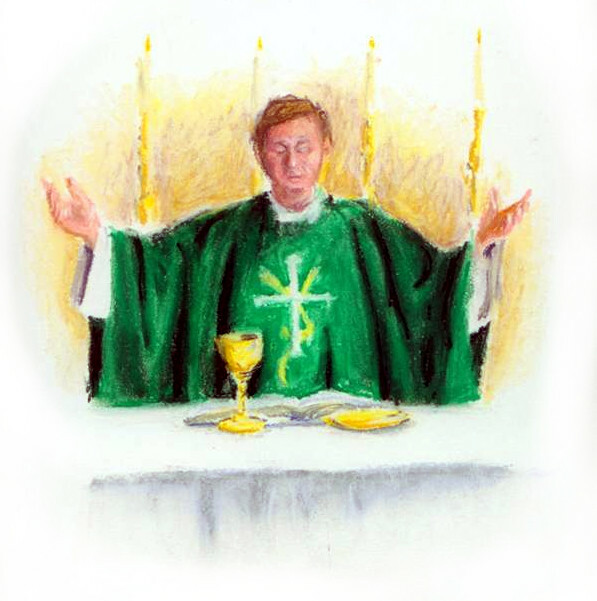 Eucharist - In this Sacrament, we give thanks to God and take part in the Mass. This is at the very center of all that it means to be Catholic. Grace - God's life within us. It is a free gift from God and we do not earn it. It is the power that we have to choose love, to do good and avoid evil. Pray - When we talk with God and listen to how God speaks in our hearts. When we pray, we stop what we're doing and turn our hearts to God.